LOWER JAW DROP ALERT! Everything's coming up emeralds these days - from the couture at the Cannes Film Festival to fashion frenzy at The Met Gala. 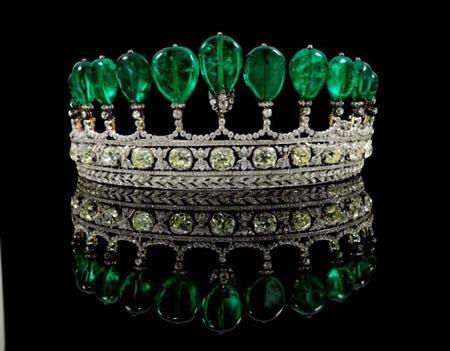 So it comes as no surprise that one heckofa crown jewel - an emerald and diamond tiara - sold at Sotheby's Geneva auction last week for a price-busting $12.76 million - the highest price ever achieved for an emerald jewel. "It is needless to say a world record price at auction for a tiara," said David Bennett, chairman of Sotheby's Europe and Middle East jewelry department. An anonymous bidder from North America is the lucky owner of the royal green gem. Oprah's got some down time coming her way. Maybe she wanted a crown to go with her Queen of Daytime moniker? But who needs Oprah (sorry, Gayle) when you've got me to bring you buckets of bling on a budget, right? 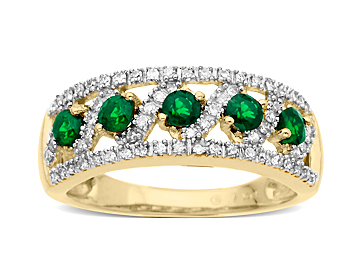 To that end, I give you one of my favorite emerald styles on the NEW Jewelry.com. I like it because it could be a great fashion piece - OR - an alternative bridal look. And at just over $200 for real emeralds and 1/4ct of diamond ice? Well, let's just say you don't have to marry a prince to bring one home for your own collection. Not your style? Check out Jewelry.com's entire emerald jewelry treasure chest here. Go green or go home, jewelry hounds!